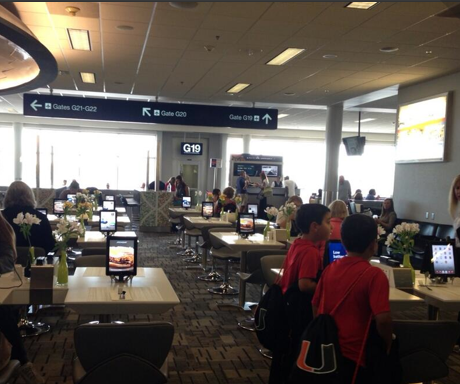 Minneapolis Airport provides wireless connectivity as well as multiple devices for travelers to use. Last week I attended a national conference and learned from keynote speakers, educator presentations, and conversations with newly met colleagues. I also learned from an eight year old at the airport and from his mother on the plane. My week culminated in a Google Hangout with fellow educators and two little girls who gave me insight and ideas for improving education. Where we learn and who from is becoming a grey area. A delayed flight prompted passengers to while time away with digital devices, easy to do at the Minneapolis airport that just happens to be a very wired facility. As I played an MMORPG on my computer, an eight-year old boy looked over my shoulder and asked me what I was doing. When I answered that I was playing a game he asked “what is the point of the game”. A discussion of objectives, leveling/improving, collaboration, communication and problem solving followed. The boy did most of the talking as I asked him questions about his major online game playing, which I discovered was Minecraft. The child described how he built and worked with his friends, how he had to figure things out and how it sometimes took more than several tries to get it right. “How did you learn all this I asked?” “From my older brother and youtube” said the boy. As I found my seat on the plane I found myself in the same row as my new young friend who expressed delight at our proximity. As it turned out I had a conversation with his mother who told me her son attended a wonderful and highly technical school but was not doing well in mathematics and she had to home school him to get him up to par. The boy chimed in that he had moved up 2 grade levels in mathematics. “What materials did you use? how did you do it?” I asked. “The Internet was helpful” said the engineer mother. Mom went on to tell me how her work required collaborating with colleagues in three different countries and how important it was for children to learn the skills necessary for this type of distributed work. MousyMoose and Giraffe619 give educators a tour of the Minecraft build these pre-teens built, in just four days. Upon arriving home, I logged into GamesMOOC on Saturday afternoon to catch an hour of the Minecraft Open House that included discussion with two little girls who had been asked to “build and create” with very few parameters. The pre-teen sisters built out an amazing space in just four days. Space that will be used for educators to meet and learn. 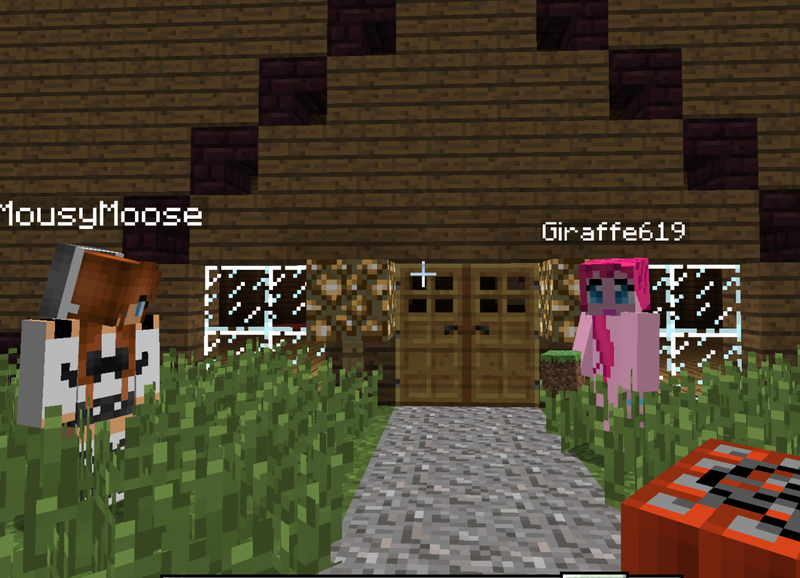 Mousymoose and Giraffe619 were most articulate as they described their processes, challenges, and successes. The girls demonstrated evidence of Twenty-First Century skills, effective communication, collaboration, research, problem solving, and analytical thinking. By the tone in their voices it was also clear that they had enjoyed the experience and took pride in what they created. My interactions with the children occurred after attending the educational conference, at which the word Minecraft came up only once, (a keynote speaker mentioned that his child was an avid builder/player). The traditional setting of workshops and speakers, with focus on theory, took on more meaning after my interactions with the children. Change is coming to how we teach and learn, it has to.